December | 2013 | Mothers Against Wind Turbines Inc.
Germany’s highest court has ruled against the owner of an Enercon wind turbine. Enercon is the largest producer of wind turbines in Germany and major supplier to many wind projects in Ontario. Owner of an Enercon wind turbine was successfully sued by a citizen’s group for making false claims that their turbines do not emit cyclical sound – the culprit swoosh/ thump that causes sleep disturbance. The United Nation’s World Health Organization’s (WHO) which Canada is a party to, classifies sleep disturbance as a serious harm to health. Ontario has to be forced to apply its own penalties for cyclical sound (5dB) and impulsive sound (10dB) to wind turbines. Setback distances to homes double and sleep disturbance, vertigo, tinnitus all identified as harms to health in the MOE study, are minimized. CALL FOR ENFORCEMENT OF CYCLICAL AND IMPULSIVE SOUND PENALTIES ON WIND TURBINES. 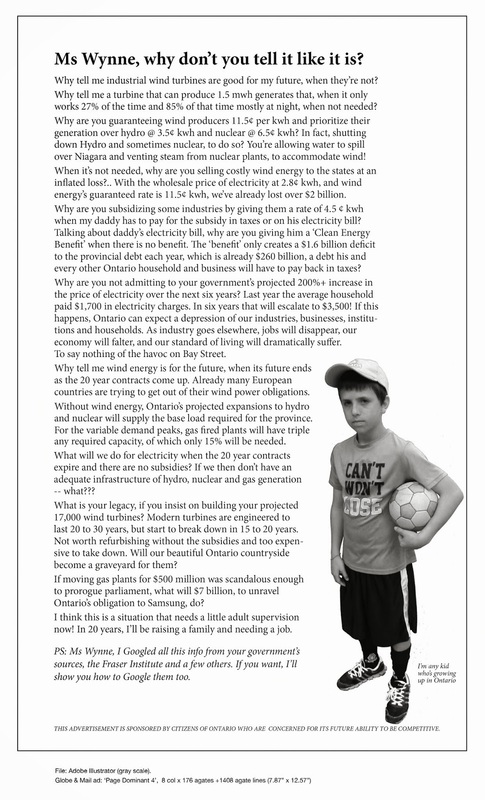 Christmas 2013 letter from a former Haldimand Resident Family; Who left because of the invasion of Wind Turbines. Reprinted with Permission. As most of you know and some may not we made a very difficult decision in our lives to move from our very beautiful home in the woods of Haldimand County. This decision was very hard as we had never planned on leaving our wonderful oasis. However with the invasion of Industrial Wind Turbines and the knowledge of what they really can do to you physically as well as emotionally we decided that that was not what we wanted to live near. So we found a new home in the North near the Xxxxxx River. We moved here in mid August and we absolutely LOVE IT. One of the not so pleasant aspects of our move is that we really do miss our families and friends. We had 10acres and now we have 162acres; lots of room to roam and explore. We’ve done some exploring on our land, but still have lots to see. Since moving up here we’ve seen moose and bear; not on our own land, but we have seen them. We do miss the variety of birds as we don’t see as many here as we did back in Haldimand. The boys have adjusted well to the move and are really enjoying their new surroundings and school. They’ve met new friends and love that they have even more land to play on. Xxxxx is now 9 and Xxxxx 6-1/2. (pictures attached). Xxxxx is our book-worm, loves to read and is very knowledgeable and Xxxxx keeps us on our toes, very busy and curious about everything. I don’t have a barn or pasture set up for my horse yet, but she is boarded right across the road, so it’s very convenient to walk over and see her or ride. We also brought a new puppy into our home in May, she’s a white lab/husky cross and the boys are really fond of her. So that makes 3 dogs, 1 cat and 1 horse. Wow what animal could we get now ! We got the farm now lets see ahhhhh chickens, goats, cows, sheep…… hummmmm never know. Xxxxx, Xxxxxx, Xxxxx & Xxxxxx xoxoxoxo and pets too ! Enercon, Europe’s largest wind turbine manufacturer, has a problem: The decision of the Bavarian Higher Regional Court in Munich about the wind turbine in Kienberg points out that in the E 82 turbine emits pulsed noise. Therefore to any actually measured sound level three decibels would have to be added. This supplement seriously could question any wind turbine site close to dwellings. As previously reported, the 27th Civil Division of the Bavarian Higher Regional Court now affirmed the pulsed noise and granted a lawsuit by opponents of the wind turbine in Kienberg, Marktgemeinde Rennertshofen. ” To us this verdict is completely incomprehensible”, says Felix Rehwald, spokesman for the largest European wind turbine manufacturer Enercon. The market leader, headquartered in Aurich, Lower Saxony, Germany, sells its wind turbines with the grade “no pulsed noise”. Experts instructed by Enercon have not confirmed pulsed noise so far said company spokesman Rehwald. Now the sentence of the Bavarian court bothers the Enercon-lawyers. They will consider further steps. And this is an important addition. The Federal Court of Justice has rejected the ENERCON case. The Federal Court of Justice is the highest Court for such cases in Germany, so Enercon has no possibility to go further in this case. The 3 dB addition for pulsed noise for the E82 is official. This 3db penalty means that these Niagara Region Wind Corp Enercon E-101 turbines, which are even larger than the Enercon E-82 model turbines, would no longer be able to be squeezed into our populated rural communities. The day of reckoning is here. Yeehaaw! Better luck next year alarmists. Read the rest of Lawrence Solomon at Financial Post. As the Sun sets on Solar…. Billions of dollars have been wasted on this renewables scam…..once we end the insanity, we will have to begin the “clean up”, and that will be a nightmare! A mother of two teenage children who lives only 500 metres from a wind turbine at the Corkermore site where a rotor blade broke of in last week’s storm, has for the first time spoken publicly about wind farms. On reading the comments in the Donegal News last Friday from Cllr John Boyle that their was ‘no danger’ from the sheared blade, Ms Carol Duddy contacted this paper. She got planning permission for her home six years ago in the Corkermore area when there was no mention of erecting wind turbines. “Cllr Boyle said the turbines were no problem for the neighbours – he wasn’t speaking for me and I live closest to one. I am not happy with the noise and the flicker effect and I am particularly concerned that a blade could brake off. What would have happened if it had hit someone or my house? “We have seen a turbine collapse and if one of these did it would not be far from my back door,” Ms Duddy said. She contacted Donegal County Council after the blade broke off last week and was told it had nothing to do with them. “I am very annoyed and they are looking to erect another four of these turbines – my house actually vibrates. “Up until now I have said nothing as I just wanted to keep the peace but now I want to know who is answerable if something happens. I rang the windfarm operators and the Health and Safety Authority and no one has come back to me,” Ms Duddy concluded. I am a retired Special Education teacher with 32 years in the classrooms of your province. I thoroughly believe in the group, Mothers Against Wind Turbines. Their mandate of “Protecting our children from industrial wind power emissions is our first priority” should be followed not only by this admirable group, but also by the politicians of our province. During my years in the classroom, the special needs children experiencing ADHD, CAP, Autism, Asbergers…to name but a few conditions….could best learn in an environment that was quiet, peaceful, supportive and calm. Extraneous noises…a lawn mower, a car revving, a noise from the hall would always set the learning environment into total disarray. Now you are expecting these children to live and learn in the shadow of these monolith turbines where low frequency sound, acoustical noise, mechanical noise, infrasound, electromagnetic radiation, dirty electricity, transient voltage, light flicker and vibration are at war with each other. The results will be that our special needs children will suffer physically, emotionally, and psychologically. The interference with their learning environment will result in disastrous consequences…..all for the sake of big business, big electricity, big egos that our province does not need. May I remind you that you are harming the very children which you have identified, supported and programmed for in the past at great cost to our province through the Ministry of Education??? In West Lincoln the project 012-0613 has proposed wind turbines close to educational facilities in our area. Four IWTs are less than 2 kilometers from Gainsborough Elementary School in Bismarck. Two IWTs are less than 2 kilometers from Smithville District Christian High School and Covenant Christian Elementary School. Two IWTs are less than 2 kilometers from the Robert Land Academy and Attercliffe Christian Reformed School. Other schools are less than 3 kilometers from these IWTs. In total there are eighteen IWTs within 3 kilometers of nine different schools. Can you in all good conscience expose all the students in nine educational facilities to these Industrial Wind Turbines??? I am also very concerned with my findings which count 43 non host receptors within 620 meters of a proposed IWT. The closest home is recorded at 563 meters (Receptor 1002 , Turbine 38) . According to Enercon statistics all these non host receptors will have noise levels exceeding 40dBA. Think of the children living in these homes……being exposed to sleep disturbances, headaches, ringing in the ears, dizziness, vertigo, nausea, visual blurring, rapid heart rate, irritability, problems with concentration and memory, and panic episodes associated with sensations of internal pulsation or quivering which arise while awake or asleep. As I understand 3MW turbines have never been installed at these distances and this fact has been acknowledged by the MOE. Is the MOE condoning this project and if so, what is that decision based upon??? Is the MOE aware that children may be at risk??? Who lives in these host properties??? Are there seniors in residence??? Are there children in residence??? If there are innocent children in these homes does it appear that the host is willing to pimp his children for money from the wind company??? These children have no recourse. They cannot protect themselves. Their parents have let them down….just like the case of any other child in our system who is abused physically. Who rises to remove the children from this abusive situation??? Now is the time for our provincial government agencies to come to the aid of all our children in West Lincoln and surrounding areas included in project 012-0613. Protect them. It is your absolute responsibility to do so. I look forward to your answers and solutions…..
More evidence of the scam we have been warning people about!! This scam has nothing to do with our “environment”. It is all about green–the mean green, the almighty dollar. They have found a way to rob us blind, with the aid of our provincial government, and we are not the only ones. This is a world-wide scam, and if it is not shut down, immediately, our entire way of life, will be destroyed.